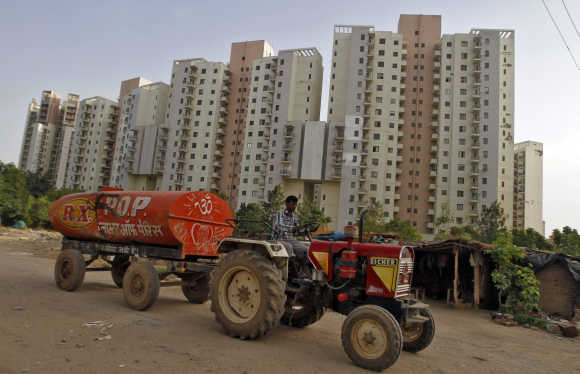 Urban areas in and around Delhi account for a stunning 40% of unsold real estate in India’s top eight cities.The NCR has a total of 303.48 million sq ft (or about 303,000 apartments) of unsold real estate.At the current pace of sales, this stock of housing requires another 53 months to be completely sold off. In comparison, for the Mumbai region, the figure is about 48 months, while it is the lowest for Bangalore at 19 months. For the top eight cities combined, the 765 million sq ft of unsold space will require at least 35 months to be sold. For a discerning buyer looking to acquire a luxury pad in Mumbai, Vithal Nagar Co-operative Housing Society in the suburbs may not sound like a great address. But, what if this is where Bollywood superstar Amitabh Bachchan’s Juhu bungalow Pratiksha is located? That information is certainly going to draw in several loaded home buyers. Because of Bachchan’s presence here, the location has turned into a prestigious one.Residents take pride in being part of this address. Prices are higher as it is counted as a prominent address. A REIT can be set up by a real estate developer or a private equity fund by pooling together rental real estate assets -office buildings, malls, warehouses -into a trust. A REIT issues units that are traded like a mutual fund unit on any exchange that it is listed on.Like shares represented ownership in a company, a unit of REIT represents ownership of a pool of rent producing real estate assets, or of a company owning a real estate project. Capital market regulator Sebi will shortly announce final guidelines for REITs. So what does this mean to retail investors?Investments in REITs will be backed by assets, so they will be ideal for retail investors who want to get a piece of Indian real estate but without the hassles of property titles and other regulatory risks. And how will REITS help real estate companies? REITs will provide an exit option to real estate developers and to funds that own a stake in income-producing assets across India. It will provide builders a cheaper source of capital and the muchneeded liquidity to those who are highly leveraged. It will also reduce the exposure and risk assumed by the Indian banking system in the real estate sector. Market regulator Sebi had notified the regulations for REITs last year, but there was lack of clarity on tax benefits for the new product from the govt’s side.There was a concern over double taxation of REITs.The finance minister,Arun Jaitley, announced in this budget that REITs will have pass through in relation to income from the project, which will eliminate multiple taxation.So.now REITs are likely to take off. Pre-sales and soft launches are now a common practice in the real estate industry in The MMR. Builders go for pre-sales to get immediate funds. In case of pre-sales, buyers or investors make a down payment, which could be just 20% to almost half the cost of the flat, in return for a discounted price offered by the developer.In some cases,by getting people to book flats by paying just 10% to 20% before the first brick is laid, developers have manage to sell 200 to 300 flats even before the project is publicly announced. Many builders go for pre-sales the moment they buy the land and mortgage it to the bank. The BMC now charges builders who want to avail of extra construction rights, called fungible FSI, and transfer of development rights, a premium. Builders require funds to pay this premium.Hence they start selling units even before a project begins. The approvals can take over a year after pre-sales.